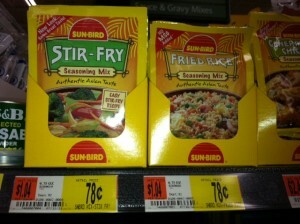 FREE Sun-Bird Seasoning + Overage! Hurry and print this new Sun-Bird coupon to score a freebie at Walmart! = FREE + $0.22 overage! Also, make sure you print the BOGO free Sun-Bird Seasoning coupon while you're there! Click here to get the coupons! Thanks, I Heart the Mart for deal and photo!